A reforestation will take place in Punta de Mita on July 11th to commemorate Mexico’s Arbor Day; the 26th edition of the BCN will happen on July 9th; this past July 1st Fonatur and a group of children helped reforest an area of Litibú. The Riviera Nayarit as a tourism destination is committed to conserving the environment: on July 11, 2016, several sectors will unite to help reforest Punta de Mita, both as part of the EarthCheck Nuevo Vallarta Committee activities and to celebrate Mexico’s Arbor Day. The activities begin at 5 p.m. at the Punta Mita Sports Complex. The goal is to plant 250 trees, mainly primaveras. The invitation to help with the work is open to the public. The Bahía de Banderas City Council, the Punta de Mita Foundation, Conanp, Peacecorps, Entre Amigos, the Riviera Nayarit Convention and Visitors Bureau, regional hotels and tourism service providers are behind this particular effort. This reforestation project began last year to take advantage of the rainy season and it reached its goal of planting over 2,000 trees in different areas of the Riviera Nayarit. The 26th Riviera Nayarit Beach Cleanup Network effort will take place on July 9th. This activity has been ongoing for the past two years and will continue to clean beaches, rivers and ravines to keep the least amount of trash from reaching the ocean, especially now the rainy season has begun. Francisco Méndez Vargas, regional delegate in Nayarit for the National Tourism Trust (Fonatur, by its acronym in Spanish), announced a family reforestation activity took place this past July 1st. 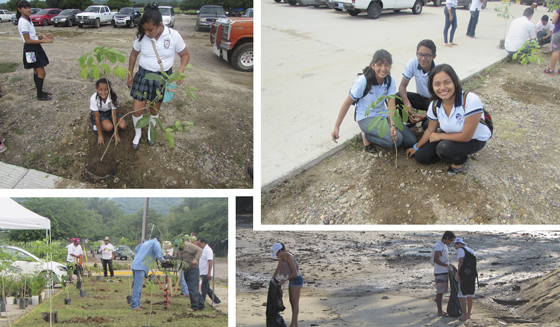 Fonatur personnel and their children planted some 50 trees in the median on the entrance from Litibú to Higuera Blanca.